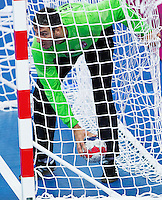 This gallery contains images from the men's handball and women's hockey on Day 12, the 8th August 2012, of the London 2012 Olympic Games held in London, Great Britain, between the 27th July and 12th August 2012. All images are available for online purchase for Rights Managed Editorial use only. Please note all uses must comply with International Olympic Committee and LOCOG usage rules. No image may be used for any commercial purpose or in contravention of those rules. Additional images from this and other events can be found via the search function on this web site.